I’ve wanted to read more of Richard Marsh’s work ever since I read Curios a few years ago, and knowing his dates I checked to see if their might be a book that would fill one of those tricky early years of my Century of Books. There was – actually there were several, and The Chase of the Ruby caught my eye. It actually took me back to a time when I was seven or eight. My best friend was called Lucy, she was the daughter of our vicar, and she lived in a big four-storey cottage just a few minutes away from where we lived. We used to spend our Saturday mornings upstairs, watching high drama on the television. The names of the various serials escape me, but they were a natural progression from the Saturday cinema matinees that a slightly older generation will remember. There was action! There was drama! There was romance! There were plot twists aplenty, and a cliff-hanger at the end of every single episode. 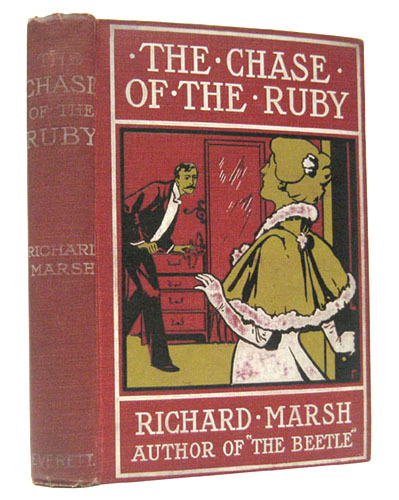 We were hooked, and I could imagine The Chase of the Ruby being dramatized and captivating us in just the same way. The story began with a young man returning to London from South Africa, Guy Holland had gone to South Africa to make his fortune, so that he could marry his sweetheart, and to make her father – a wealthy merchant – understand that his intentions were honourable. He came home because he dreamed that his uncle was dead, and when he arrived home he found that he was. Guy and his sweetheart, Miss Letty Broad, were so happy to be reunited, and they rather hoped that he might have left Guy something so that he wouldn’t have to go away again and they could marry. But there was another nephew – Guy’s cousin, Horace Burton – and there was an extraordinary. Guy would inherit everything if, and only if, he could recover a certain ruby ring that a certain actress had obtained from his uncle by trickery, within three months of his uncle’s death. If he failed Horace would inherit everything. Now it was some weeks after his uncle’s death that Guy arrived back in London and the will was read, so he had only a few days left. And the actress in question – Miss May Berwicke – was an old sweetheart. Now there was a tricky situation! First Guy tried the simplest method: calling and asking for the ring. He was beaten in a verbal joust, and kicked down the stair by Miss Berwicke’s new fiancé. But Miss Berwicke’s maid caught him at the bottom of the stairs and suggested another, covert, approach. Miss Broad was concerned, but Guy decided that he had no choice. He got the ruby, and then he lost it. After all, he wasn’t the only person looking for it. Horace had debts, had made dubious dealings, and he desperately wanted to keep the ruby out of Guy’s hands. And it seemed that there were others trying to get their hands on the jewel too. When Guy, usually so reliable, didn’t arrive to meet Miss Broad the next day she feared the worst. But she wasn’t the kind of girl to weep and wail, she was the kind of girl to take action. And so she set out to find Miss Berwicke, to find out what had happened to Guy, and to track down that pesky diamond. It was a grand adventure, culminating in a chase around the many rooms of Miss Berwicke’s flat. Now Richard Marsh is a wonderful story teller, his dialogue sings, he can create wonderful characters, he can pull you right in to turn of the century London. I loved Miss Broad and Miss Berwicke, and I must mention a very fine cockney villain. It was lovely to visit Regents Park, and to walk along dark streets at night. But while the plot swept me along I did notice loose ends, and I was left with unanswered questions. I couldn’t quite understand the solicitor’s role, the reasoning behind that outlandish will, or why one or two interesting possibilities were raised but not followed up. I suspect that Richard Marsh had written better books, and I’m inclined to agree with those who say he was better at short stories than he was at novels. Jane, it does sound fun – and the cover the show above would definitely catch my eye, and make me want to pull that book off a shelf.